They say money can’t buy happiness, but it can buy jewelry. And that gives some consumers pleasure. Give American shoppers a little money, and they will buy a little jewelry. Give them a lot of money, and they’ll buy a lot of jewelry. For jewelers, a modified “golden rule” applies to their best customers: Those with the gold, rule. 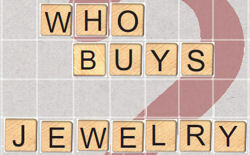 A consumer’s income level trumps every other demographic factor that has an impact on a shopper’s jewelry expenditures. The more money a person makes, the more likely they are to buy jewelry. There is an almost perfect mathematical correlation between consumers’ income levels and their jewelry expenditures. High income consumers spend disproportionately more on jewelry. While the proverbial 80/20 rule does not apply, it is close: 28 percent of all American households – those making $70,000 or more annually – are responsible for 68 percent of al l jewelry expenditures, as graph 18 illustrates. High Income Consumers Love Jewelry – Higher income consumers spend exponentially more on jewelry than lower income consumers. The average household earning $70,000 and above spent $1,206 on jewelry in 2005, about 2.4 times the amount of the average household. Why? High-income consumers have dramatically more discretionary income. A household earning $25,000 spends about $146 annually on jewelry. A household earning $150,000 – or six times as much – spends just over $2,200 annually on jewelry, or 15 times as much. This trend has been solidly in place for many years. Graph 19 illustrates annual jewelry expenditures by broad income ranges for American households. Further, high income households spend far more on jewelry than lower income households, as graph 20 illustrates. White Collar Professional Workers Spend Heavily on Jewelry – In 2005, the typical household headed by a professional spent $998 on jewelry, nearly double the national household average. White-collar workers tend to have higher incomes. Better-Educated Shoppers Spend More – Education and income levels typically correlate closely. College-educated consumers spent $926 on jewelry in 2005, nearly double the national average. High-school educated consumers spend the least; post-college educated consumers tend to spend the most on jewelry. All Ages Buy Jewelry – Consumers of all ages buy jewelry; it is a cross-generational purchase. Thus, age is not an accurate predictor of jewelry expenditures. • Age 25-34 – These young consumers have the second highest per-household jewelry expenditures in the <?xml:namespace prefix = st1 ns = "urn:schemas-microsoft-com:office:smarttags" />U.S., driven primarily by engagement rings and jewelry purchased as a gift. This age group represents mostly Gen-X’ers and a few early Millennials. • Age 35-44 – While this group of Gen-X’ers has a per-household jewelry expenditure that is just slightly above the national average, the market size – defined as the total households in the age range times their jewelry spending – is the largest in America. • Age 45-54 – This group, comprised of Baby Boomers, has been disappointing in terms of per-household jewelry expenditures. However, aggregate jewelry spending by this group represents nearly 20 percent of the total jewelry market in America. Further, after cutting back on their jewelry expenditures early in the current decade, they loosened their purse strings recently and have stepped up their jewelry spending. • Age 55-64 – This group has been a pleasant surprise. Not only is their per-household jewelry expenditure the highest of any group, but this segment consumes about 22 percent of all jewelry sold in the U.S. Ethnicity Matters – White consumers typically spend much more on jewelry than any other race or ethnic group, while blacks tend to spend the least ($254). Interestingly, Asians, who have the highest level of discretionary income levels in the U.S., do not tend to spend on jewelry as heavily as other ethnic groups with less discretionary income (an average of $410). This long-term trend was reconfirmed in 2005 when consumers in white households spent $541 each on jewelry, less than 10 percent above the average household spend of $502. Unfortunately, the government does not report these statistics for Hispanic consumers. Household Size Is A Predictor of Jewelry Demand – Smaller households (two people) and large households (five or more) are the largest jewelry spenders. Households with five or more consumers spent $652 on jewelry in 2005; two-person households spent an average of $584. All other size households spent significantly less. This trend is unchanged from prior years. Urban Consumers Spend Slightly More On Jewelry – In 2005 (the latest data available), central city consumers spent slightly more – $537 per household – than their suburban counterparts. This trend is the result of younger, wealthy consumers moving downtown. In 1970, 13 percent of all consumers age 25-34 lived downtown; in 2000, 24 percent of this age group lived downtown. Further, suburban consumers tend to carry much more debt and have less discretionary income. Rural shoppers spent the least on jewelry of all groups. trend is similar to prior years’ results. Gender Doesn’t Matter Much – Who buys jewelry by gender? That is probably not the right question. Rather, the key question is “who makes the purchase decision?” The logical answer is most likely “the female.” Unfortunately, there are no hard statistics to provide the answer. Jewelers know that women are likely to pre-shop for merchandise; they tell either the jeweler what they want so they can tell their significant other when he comes into the store, or they tell their significant other very specifically what they want. Here’s what the statistics tell us: roughly 5 percent of all jewelry sold is for men, while 95 percent of all jewelry sold is for women. At the cash register, Unity Marketing’s research says that 40 percent of al l jewelry purchases are paid for by a male and 60 percent by a female. The number of high income households has continued to climb, a trend that is expected to continue. In 2006, roughly 18 percent of all U.S. households had incomes above $100,000. By 2010, 20 percent of all households could have incomes of $100,000 or greater. But high income levels don’t guarantee high levels of discretionary income. According to a recent study of discretionary income conducted by the Conference Board, only about 63.5 percent of all American households have discretionary income. Very broadly, this is defined as households with income levels at least 30 percent above the median levels for their demographic peer group. The ten U.S. metros with the highest discretionary income include the following, according to the Conference Board study. The metro name is in bold if it is also one of the top ten metros for diamond jewelry sales, according to information from the Diamond Information Center. Market researchers use psychographic research to overlay traditional demographic segmentation. For example, we know that the majority of consumers buying diamond jewelry are woman. But, just being a married woman does not mean that a consumer will shop for diamond jewelry. • Assertive enthusiasts – Believes diamonds are romantic and a status symbol. Likes to make the purchase decision. High household income. • Classic recipients – Believes diamonds are always a gift of love, but whatever he picks out is fine. If it is a surprise, that’s even better. This segment has the highest household income and the highest average ownership of diamond jewelry. • Fashion forwards – Diamonds have little romantic resonance. Diamonds must fit her wardrobe as a fashion statement. High income households. • Budget romantics – Likes diamond jewelry, but it doesn’t fit into their budget. Views diamonds as aspirational; buys only for major occasions. • Apathetics – Would rather have other gifts. Has no emotional connection with diamond jewelry.